**Immediate family members living in one household. Season Passes include Lap Swimming. 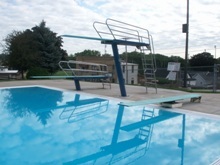 See the Financial Assistance section in our Summer Program Guide to learn more about Kaukauna Lions Club Sponsorship of pool passes. Rental Available for City Residents Only. Have your next birthday party, family reunion, or get together at the pool! Reservations are first-come/ first-served beginning January 1st. Staffing of certified lifeguards is included in rental cost.